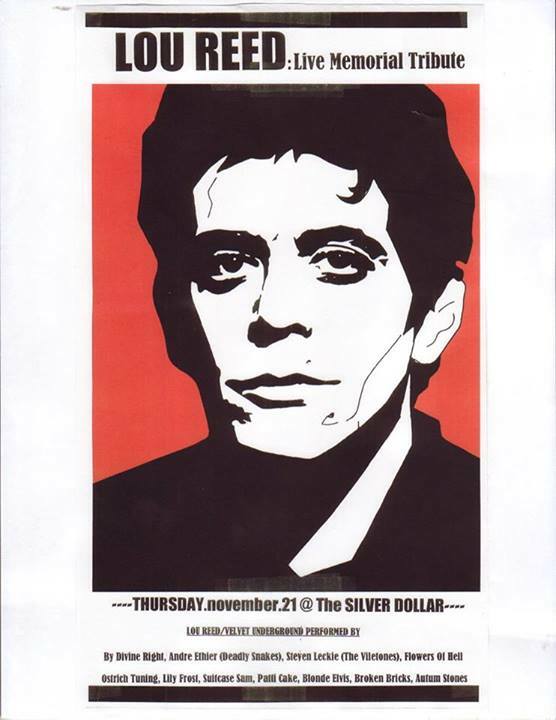 Tribute events in honour of Lou Reed’s life have been various and plenty since his death on Oct. 27, including a number in his longtime home base, New York City. The outpour of public emotion has been indicative of an extensive and textured community that found inspiration in the artist, but on Thursday, Nov. 21, Toronto concert promoter Dan Burke gathered a studded lineup consisting solely of Toronto artists wishing to pay respect to their deceased influencer at the Silver Dollar. Now, thanks to live recordings blog Mechanical Forest Sound, you can download the entire concert. Spending the entire night playing songs from Reed and The Velvet Underground’s catalogs, there were performances from The Autumn Stones, Blonde Elvis, Broken Bricks, By Divine Right, Patti Cake, Lily Frost, Mike Mikocic, Suitcase Sam, and Dave Schoonderbeek, and while former Deadly Snakes guitarist/vocalist Andre Ethier joined the Flowers of Hell, Steven Leckie (of Toronto punk veterans The Viletones) joined TO drone squad Ostrich Tuning – who owe their very name to Reed, who once coined the phrase to describe a trivial guitar tuning he used. This entry was posted in Burden of Salt and tagged Andre Ethier, Blonde Elvis, Broken Bricks, By Divine Right, Dave Schoonderbeek, download, Flowers of Hell, free, Lily Frost, Lou Reed, Mike Mikocic, Ostrich Tuning, Patti Cake, Steven Leckie, Suitcase Sam, The Autumn Stones, The Deadly Snakes, The Velvet Underground, The Viletones, Toronto, tribute concert on November 25, 2013 by Tom Beedham. around the internet. Shame on Google for nott positioning this publish upper!